So, you’ve tried searching for the best fantasy board games online and found nothing relevant? Do you get stale reviews, dated information, and board games that are not exactly fantasy? We know, we’ve been there too. In fact, this is the reason we have put this guide together for you. Without a doubt, there are classic fantasy board games that barely age and deserve the place amongst all-time greats. At the same time, some of the recent releases are shaking up the board game world, and you want to know about them. 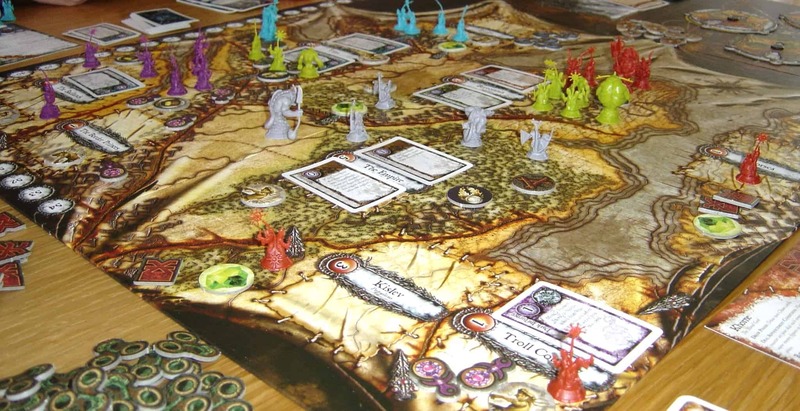 Historically, the fantasy board game genre was born by a rapid expansion of the immensely successful fantasy role-playing game Dungeons & Dragons. The game was released in the 80’s and is still running strong. Since, board games have advanced significantly in their design, mechanics, and gameplay. On the other hand, the core of what makes an epic fantasy board game experience is still the same. The definition of a good fantasy board game is free to interpretation and could mean different things for different people. For us, however, it goes back to the roots. It is an experience that is highly thematic, fictional and favors role-playing. Board games where players send their heroes on adventures, quests to explore deep dungeons and dark caverns crowded with exotic and evil creatures. If this sounds like something you’ve been looking for – perfect! We have put an incredible effort cherry picking the best fantasy board games out there. We have considered different fantasy worlds, difficulty levels, player count, and game duration. In short, we are likely to have an excellent pick for you whatever your preference is. The best fantasy adventure we could find. Role-playing, campaigns, character development, and 95 included scenarios to keep you busy. One of the most successful fantasy board games ever made. Players get to crawl dungeons, discover artifacts and up-skill characters to fight evil. A fantasy world full of tension, ambition, betrayal, and deceit. You get to make an alliance, break it and get betrayed. Brace yourself! A lightweight fast-paced fantasy adventure game that works for both kids and adults. Great narrative and loads of fun! A true fantasy war game masterpiece with beautiful miniatures and epic scale battles. Control armies and heroes, forge alliances. An amazing Viking saga where falling in a battle earns you a place amongst gods. An unparalleled strategic depth and countless ways to win the game. A light fast-paced two-player fantasy board game set in the realm of Terrinoth. As punchy as a 60-minute wargame can be. Extremely dynamic, but not brain burning. Visually stunning, easy to learn and quick to play. Works great with families and kids as a casual, getaway board game! Ready to take on a role of a god in the thematic Warhammer fantasy world? Each god is played differently as it has unique strengths, skills, abilities, and ways to win. Beautiful artwork and immersive storytelling where you get to define the story line by making decisions. The game features ‘learn-as-you-go’ mechanic, so it never feels overwhelming. The best fantasy adventure we could find. Role playing, campaigns, character development, and 95 included scenarios to keep you busy. A fantasy world full of tension, ambition, betrayal and deceit. You get to make an alliance, break it and get betrayed. Brace yourself! Gloomhaven is a game of tactical combat inspired by classic Euro mechanics that work brilliantly together to produce a remarkable fantasy board game experience. The game was released last year and has taken the board gaming world by surprise. The second printing attracted 40,000 Kickstarter backers raising $4 million in total. Not only has it managed to become the best fantasy board game of the year, but since, it has climbed to the top of the pedestal within a matter of months to become the best board game ever made according to BGG. Gloomhaven features a cooperative campaign mode consisting of 95 scenarios giving you over 200 hours of play time. Players get to control fantasy characters completing scenario objectives and advancing in the overall campaign. Besides each character gets to accomplish personal quests. Completing hero quests grow your characters but make them exhausted at the same time. You will find yourself changing characters multiple times through the lengthy campaigns. 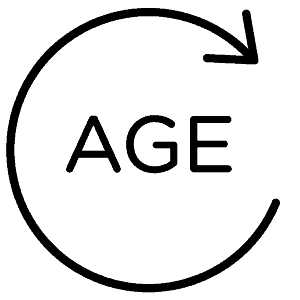 Characters age and retire making way for new characters to enter the play. It may feel strange at first, but if you think of your characters as mercenaries rather than heroes, it feels right. Over time, we have learned to like it. It feels like an additional flair that helps to maintain a good level of engagement throughout the game. There are 12 different character classes in the game. Each features a surprisingly unique playstyle and abilities which contribute to the already impressive replay value the game offers. At the start of the round, each player chooses two cards to use in the given round. Selecting the right cards for the circumstances is the key to a successful round. Overall, individual actions may feel essential, it is the team strategy that you want to keep coherent and efficient. Getting the team alignment is more challenging than it may sound at first. Players are only allowed to communicate using general terms. You are not allowed to mention specific actions you are going to take or cards you are planning to use. It pushes the team coordination to a new level and gives a great bonding feel as your teamwork matures. Unlike a typical dungeon crawler board games that feature dice for combat, Gloomhaven uses cards to resolve battles. They act as modifiers to the player’s attack values, items, and other player abilities. Overall, the change feels quite welcome and refreshing to the otherwise staid combat mechanic. If you like cooperative boardgames with a fantasy theme, you will love Gloomhaven. The concept of cooperative play is profoundly and firmly ingrained in everything you do in the game. Fighting monster, solving quests, coordinating rounds and even shaping the storyline, all done together in a joint team effort. Moreover, Gloomhaven does a fantastic job on multiple fronts. As a result, in our other reviews, we have also nominated the game as one of the top coop board games and best RPG board games around. Gloomhaven comes with an enormous world to explore, 95 scenarios and close to 200 hours of the finest fantasy board game experience there is. The dice-less combat system gives the sense of control, while the profoundly thematic and engaging branching narrative shapes and curves the storyline making it unique and unpredictable every time you play it. The game currently holds the BGG crown for being the best board game ever made. You would only need to play one scenario to understand why. 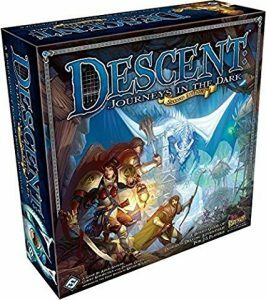 Descent: Journeys in the Dark (Second Edition) is one of the most successful fantasy board games released to date. In the game, one player takes on the role of a treacherous overlord while other players take on roles of brave heroes trying to stop the overlord from carrying out his evil agenda. The game features a campaign mode, with storytelling and character progression for both heroes and the overlord. Throughout the game, heroes embark on various adventures and quests that require ancient ruins, cursed forests, dangerous caves and dungeons to be explored. There you will find monsters to battle, riches to gain, and advance on your journey of stopping the overlord. Depending on your gaming preference and the time available, Descent offers two ways of play. You can either play an individual quest or engage in a long-term commitment by playing a campaign. Quests are broken down into two acts which take around an hour each to complete. Each quest has unique goals, both for heroes and the overlord. Also, the quest objectives are rarely plain or straightforward, such as kill all monsters in the dungeon. Most objectives are creative, thematic and tell a story in details. For example, you may need to save guests from a masquerade ball or steal some farmers crops if you are the overlord. Campaigns typically represent multiple quests strung together. However, the quest sequence in campaigns is not always predetermined. Depending on the outcome of one quest and whether the heroes or the overlord wins, the next quest gets determined. It makes the gaming experience and storyline somewhat unpredictable and adds a nice element of surprise and a plot twist. 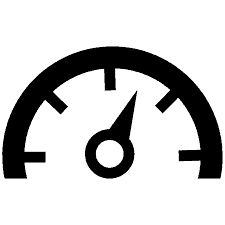 The fast pace is extremely important at successfully completing quests and winning campaigns. On your turn, you will find yourself presented with dozens of options most of which you would need to ignore as your heroes can only do so much before they get exhausted and require a rest. Part of the quest puzzle is picking the right battles to fight, doors to open and interactions to engage in. In fact, it feels that the time is your worst enemy and not the evil monsters spawned by the overlord. Descent: Journeys in the Dark (Second Edition) provides an equally engaging, fun and enjoyable gaming experience for both heroes and the overlord. Unlike other dungeon crawler games, it supports an overlord character progression and allows the overlord to win quests too. Some quests, however, are inherently unbalanced, so it is important for the overlord player to adjust the gameplay difficulty for heroes to make it an enjoyable process for everyone. The game comes in a box full of miniatures, cards, tokens, and tiles. Given that you have a good imagination, you should find all the pieces to build a custom adventure experience and develop your own storyline as you go. Overall, the game brings to the table everything you would expect from a campaign-driven fantasy board game. It has character progression, amazingly crafted and unique quests delivering an intense gaming experience that sometimes comes down to a single roll of the dice. We have also nominated it among the top tabletop RPG games to hit the market in one of our other reviews. Descent: Journeys in the Dark (Second Edition) is a game of elegant complexity. It offers a fantastic fantasy world setting with components of the highest quality. The gameplay is fun yet tense as each dice roll or decision can have a long-term dramatic effect. Thankfully, the smart game mechanic adapts campaign storyline to ensure the gaming experience remains balanced. If medium weight, fantasy dungeon crawler with campaign mode support is what you are after, Descent is a time-tested classic that has earned its spot amongst the best fantasy board games of all times a decade ago. A Game of Thrones (second edition) is based on A Song of Ice and Fire series of fantasy novels by George R.R. Martin. In the game, the players take on roles of the most influential houses of the Seven Kingdoms of Westeros in the battle for the Iron Throne. Just like in the real world, to win the game the players need to apply a winning combination of warfare, diplomacy, negotiation and tactical skills. You need to secretly take advantage of your strengths and exploit the weaknesses of your enemies. At first sight, the map looks geographically unbalanced yet in reality, each house’s position is carefully thought out. Besides, there is nothing that houses share in the game as units, cards, and special abilities are unique for each. The differences in resource availability, access to the sea, neighboring lands and stronghold locations cumulatively deliver an amazingly balanced and unique gaming experience every time. Given the location particularities and different special abilities for every house, the strategy and tactical play vary greatly making the game highly replayable. Each game round consists of three phases – Westeros Phase, the Planning Phase and the Action Phase. During the first phase, the players need to work jointly to fight the Wildlings advance which carries detrimental effects for all players. During the Planning phase, the players get to issue secret orders to their available units on the map. The orders may represent moving troops, attacking other player armies or strongholds, as well as mustering armies in preparation for the next round. Lastly, the Action phase reveals and executes the players’ orders in sequence. At this time it is too late to react and you have limited options to counter something you have not seen coming. This, in essence, is the core of the game that makes it so intense, intriguing and frustrating at the same time. Players tend to break their promises and alliances with other players when you expect it the least. The betrayal options are many, you may choose to attack when you’ve said that you would not, take sides when other players are fighting, break geographical area control commitments and much more. The sense of intrigue, borderline paranoia is deeply built into the very fabric of the game that does an amazing job at breeding distrust between the players. There are no friends in A Game of Thrones and there is no one you can trust as being backstabbed, in most cases, is just a matter of time. Overall, A Game of Thrones is an amazing experience of betrayal and deceit that encapsulates everything that makes George R.R. Martin’s books so enjoyable. If you do not take being manipulated, bashed, betrayed, ganged-up on or outwitted the wrong way, you are set for one of the best fantasy board games experience to have ever hit the table. A Game of Thrones (second edition) is a masterpiece given you are six (the best) or 5 players. It offers beautiful and straightforward gameplay that comes with an incredibly strategic and diplomatic depth at the same time. Each game, battle, negotiation, and betrayal feels different and offers a unique gaming experience every time you play, even with the same players. If you have an itch to do the nasty things you should not be doing in real life – A Game of Thrones is one of the best fantasy board games for the job. Mice and Mystics is a story based cooperative dungeon crawler that works great with adults, kids, and the whole family. The story goes that the king lies ill while the kingdom is overruled by an evil witch Vanestra. The players take on the roles of the loyal members of the king’s court jailed by the witch in the trenches of the castle. To escape the prison, save the king and the imperiled kingdom, the loyal members have turned themselves into mice. Throughout the game, players rush through the castle facing the enemy’s minions, rats, cats, centipedes, spiders and worst of all – Brody, the witch’s cat. Each game represents a chapter in the overall story-driven campaign that the players need to complete in order to get one step closer to the king and the overall campaign victory. Each scenario challenges the players with unique objectives, map layout, thematic setting and is time sensitive. 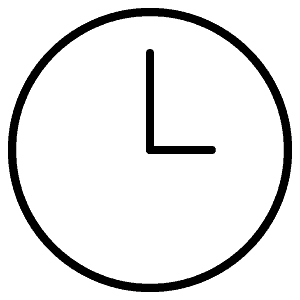 Failing to complete the objective in time also fails the scenario, which eventually needs to be replayed in order to advance in the overall campaign. The gameplay is pretty straightforward as each turn consists of two parts – movement and action. Movement advances are determined by a dice roll, whereas the action is selected by the player and may represent an additional move, search, recover, attack or explore attempts. Mice and Mystics introduces a unique concept called the Cheese System. It allows the players to collect pieces of cheese throughout the game. Every bit of cheese you find allows to learn new special abilities, level up or cast a spell. To hoard precious crumbs of cheese, players must roll a cheese symbol on dice when fighting or making other dice rolls. It makes the gameplay more fun and slightly less predictable. The rules are easy to learn, and there is a great video tutorial from the publisher to help you start. 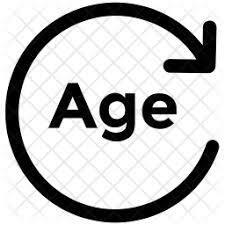 You should find the rules to be simple enough for anyone who is eight years or older to grasp. Although the game comes with some role-playing elements, it can only scratch that role-playing itch a little leaving hard-core RPG fans wanting more. At the same time, if you are after some light, perhaps family based fantasy experience that is full of thematic fun – Mice and Mystics ticks all the right boxes. Mice and Mystics offers a lightweight, easy to learn yet an extremely fun gaming experience full of adventure and childlike playfulness. If you are looking for a fast-paced fantasy board game with a light touch of RPG and a compelling story, Mice and Mystics is definately worth checking out. The game works equally well with both adults and kids making it one of the best fantasy board games out there to enjoy with your family and friends. 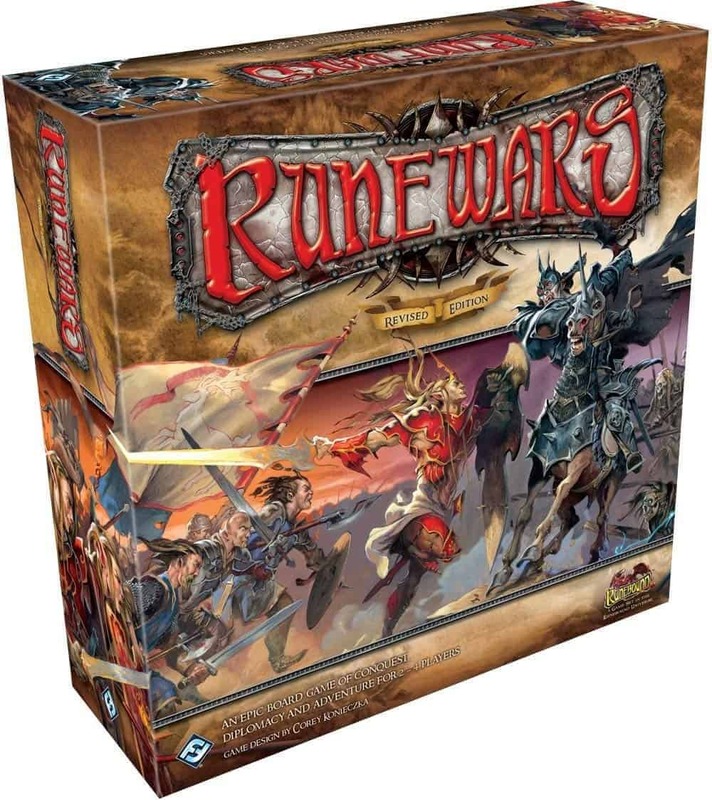 Runewars is an epic fantasy board game of war and adventure that pits 2 to 4 players in a battle for area control, dragon rune discovery and its protection. The objective of the game is to be the first to discover dragon runes by gathering resources, mustering armies, crushing opponents and laying siege to strongholds. In fact, the game has all the ingredients to be considered one of the finest example of Ameritrash games. 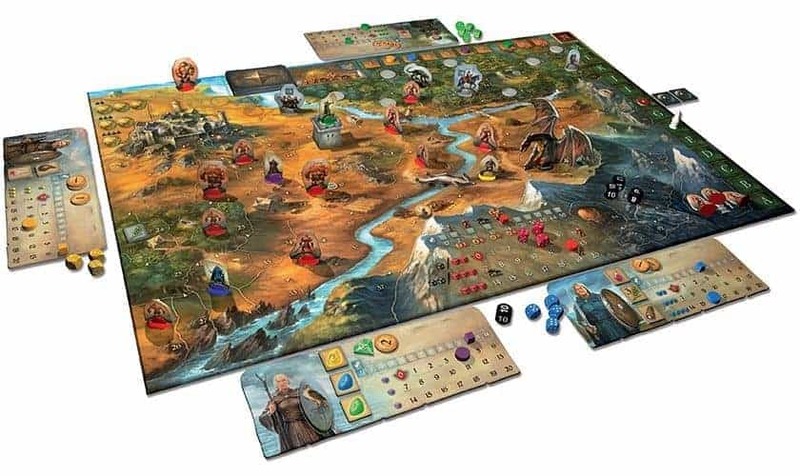 The game features a modular, dynamically constructed map that sets the stage for epic battles, hero quests, negotiations and betrayal in search of the mighty dragon runes. There are four distinct fantasy factions available in the game – humans, undead, elves, and chaos. Each faction features unique military units with special abilities and distinctive battle strategies. The game runs for seven years where each time of the year (spring, summer, fall, and winter) represents a game round. A season-based event system adds an intriguing twist to the gameplay as each season either adds or removes a condition which can be used to a strategic advantage (e.g. during winter, the water freezes and armies can walk on ice). At the start of the game, each player gets a deck of eight order cards. Those cards represent the orders you can assign to your armies (e.g. attack, muster, gather resources, etc) at the start of each season. The cards are selected secretly by all players, which are then simultaneously revealed and sequentially executed. This order card placing mechanism is partially what makes Runewars epic. It adds suspense, uncertainty and even paranoia encouraging players to backstab and break alliances when your opponents expect it the least. The other part of Runewars that makes it an epic fantasy war game is the armies and the combat system in general. Instead of dice, the game uses cards which are just as random, yet feel more innovative. Every time you muster army units, defend or attack, it feels epic. Battles are so engaging, intense and strategic that they become borderline addictive making you want to push your luck constantly, even against stronger opponents. Besides, the game features heroes that play a supporting role dueling other heroes, completing quests or acquiring artifacts. The latter can provide an advantage during battles and can help to discover dragon runes. The distinctive feature of heroes is that they almost reside in a parallel dimension. They can freely move around the map without other player’s armies being able to cause any harm or impede them. They have personal agendas and nothing, but other heroes can stop them. Through conquering lands, crushing opponents, destroying strongholds and completing hero quests, the players get to discover dragon runes. Once found, runes need to be carefully hidden and protected from other players as the player with the most runes at the end of the seventh year lands a victory. Runewars is a pure fantasy war game masterpiece. It comes with tons of plastic miniatures, beautiful artwork, decks of cards and bags of tokens. Anything you do in this game, be it exploring lands, mustering armies, attacking strongholds or hiding dragon runes looks, feels and plays epic. All of this grandeur, however, comes at the expense of time. However, if you can set an evening aside – Runewars will reward you with a grand fantasy strategy and the most heroic battles I have ever experienced in board games, without exaggeration. 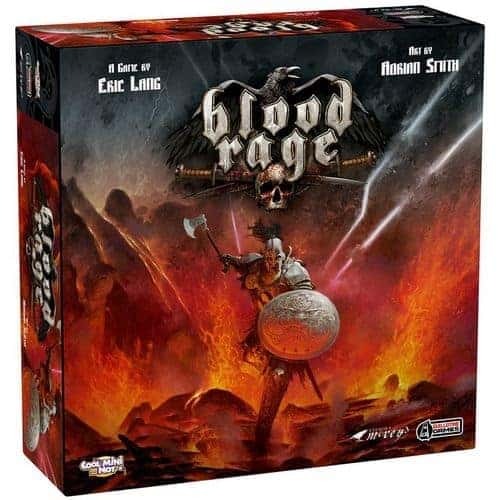 Blood Rage is a competitive board game for 2 to 4 players that sets its scene in pre-apocalyptic nordic lands. The Ragnarok has come upon and being a Viking, you’ve waited for this day all your life. It is the last chance for Vikings to go down in a blaze of glory and secure the spot in Valhalla, feasting amongst the gods and Odin himself. In the game, each player gets to control a Viking clan including their leader, brutal warriors, and ships. The game takes place over three ages which consist of six phases each. At the end of the third age, points are tallied up and the player with the most glory wins. The game offers an abundance of ways to score glory points. You can invade and raid villages, battle with other clans, complete quests, improve your clan’s stats and capabilities, or fall gloriously fighting your opponents or the mighty Ragnarök himself. Whichever way you decide to score glory points, battles are inevitable and Blood Rage does a brilliant job at it. It features a dice-less combat system that uses cards to resolve conflicts. This does two things – makes battles more strategic and tactical in nature and removes the luck based dice rolls making the combat fair and slightly more predictable. The combat system itself is surprisingly simple, yet tense and rewarding at the same time. It feels more of a mind game rather than a plain brute force clash. To resolve combats, players add combine the strength of their units with the action card that each player contributes face down. Most of the time, the cards would add an additional strength value to increase the chances of the combat success, yet bluffing approach is just as valid and extremely fun. The game uses a card drafting mechanism where the players pick one card from the hand of eight and pass the rest along for other to choose until everyone has a hand of six. Picking the cards is the biggest dilemma in Blood Rage as it could be an extremely emotional but fun exercise as you almost always want to get more than one card at a time. There are three types of cards to consider when drafting – battle, upgrade and quest cards. Battle cards typically allow you to have an advantage in combat by increasing strength or impeding your opponent’s actions. Upgrade cards provide special abilities, whereas quest cards help you with acquiring glory points so much needed to win the game and feast with Odin. Most of the cards have references to different gods and you can prove your allegiance to that god by accumulating cards of that same type. It adds another layer of combat variety and strategy as special actions, bonuses, and additional glory points become available. Blood Rage is an amazingly comprehensive fantasy board game that lets players choose their own custom strategy to earn their place in Valhalla feasting with the gods. It offers strategic depth and smart tactical combat yet remains simple enough for the new players to learn and enjoy the game right away. The combat and card drafting gets tense, fun and even hilarious at times. The unique blend of simplicity, drama, fast pace, strategic depth, and broad audience appeal make Blood Rage one of the best fantasy board games around. BattleLore (Second Edition) is a revised version of the original game two player fantasy board game set in the realm of Terrinoth. If you have played Memoir ’44 before then you’ll have an idea what BattleLore is like as it uses the same core gaming mechanisms yet wears a fantasy theme. The game pits two players sitting on opposing sides of the map to command their troops, beasts, and demons to fight squad-based battles over the key areas of the battle map. The battlefield is full of objectives completing which earn players victory points. The first player to get to sixteen victory points wins the race and the game. At the start of the game, each player needs to set up his part of the battlefield. Players get three cards each that detail individual conditions of the setup. Cards specify terrain, mountains, buildings, special victory conditions and victory point locations that could be fought over throughout the game. After selecting the card and setting up the layout, players can place their units on the map. Units can be positioned freely, to achieve better alignment with the overall strategy. The board consists of three sections – left flank, right flank, and the center. When players draw command cards, they specify the unit count and one of three sections of the board. For example, the command card may say ‘Order three units on the right’. That order allows the player to move three units in the right section of the map and initiate an attack. The challenge is to apply command cards you have in your efficiently and timely. You need to optimize the overall offensive strategy for your entire army on all parts of the board. The timing and the order you play cards in is an absolute key to winning battles as well as the game. The combat is driven by a number of a beautifully made custom dice which give the player a limited control over the battle strategy. At the same time, the dice rolls deliver loads of fun and sometimes frustration when the bad luck strikes you. Although the combat is essential in BattleLore, winning the game requires you to set your primary focus on unit positioning throughout the battle map. You want to make sure that your troops are occupying key locations that provide victory points, take advantage of the landscape or prepare you for the well times assault that can easily and quickly shift the balance of the game from one side to another. Overall, it would be hard to go wrong with BattleLore, as it uses the same tried and tested card driven system that made light war games like Commands and Colours and Memoir ’44 so successful. Nicely made miniatures, a couple of added twists, an ability to custom build scenarios and a fantasy theme deliver a great package a very broad audience of players is sure to enjoy. BattleLore strikes a wonderful balance delivering simple gameplay that is both fun and strategic. It allows players to create custom scenarios with a tailored landscape, unit positioning, and secret card deployment. For a light two player fantasy war-game, BattleLore is as epic as a 60-minute game can be. It is always tense, but never overwhelming. Small World is a beautifully designed, fast-paced fantasy board game that pits 2 to 5 players on the map that is too small to fit everyone comfortably. It is the simplest and lightest fantasy board game in our review. The game takes about one hour to play and works well with both family and friends. In the crowded fantasy land, players get to lead different races fighting for area control and geographical dominance. Each race has distinct abilities that give them an extra edge when acquiring or defending precious territories. Small World is a balancing act as units are scarce and you always need more of them than you have. You need to mobilize units to conquer new territories, but that would leave the old areas unprotected. Alternatively, if you are overprotective, you can almost never expand your influence. What should you do? Over time, your race reaches its peak performance, which then starts to deteriorate forcing you to put the race into decline. You can always pick a new, energetic and ambitious race to continue your expansion, but timing is everything. In fact, knowing when and if to decline the race is critical to a good strategy and winning the game. When picking a race, you also get to choose the superpower to go with it. Combining racial abilities and superpowers result in unique combinations that add a nice variety into the gameplay. For example, Ghouls race comes with a racial ability that allows them to remain in play after a decline. At the same time, the Hill superpower gains an additional victory point for every hill area under control. Combined, Ghouls remaining in play on Hill areas get to produce victory points. A typical turn in the game is quite straightforward. First, players get to conquer new lands, then redeploy units and finally score points for lands they control. The region conquering and the combat system is also pretty simple. The army that moves into the new area needs to have more units than the area’s defense rating. Similarly, to win battles, your army needs to have more units than the other army. The overly simplified unit advancement system does produce epic battles, yet delivers a fast-paced experience perfect for a getaway game. After conquering lands, players can reposition units they control to prepare for the next turn. You typically want more units in areas of potential conflict and fewer units in safe territories. Just keep in mind to have a presence in all areas you control to score victory points for the round. Small World is a short fantasy war game with simple rules, streamlined gameplay and gorgeous fantasy world setting. It features an innovative mechanic of cycling through different races that alter the strategy throughout the game. The game is exceptionally accessible for family evenings or introducing new players to board gaming. If you are looking for a simple board game that is quick to play and generates few laughs, Small World is one of the best fantasy board games around that you can play under 1.5 hours. Chaos in the Old World is a three to four player fantasy board game set out in a Warhammer universe. In the game, players take on roles of gods to become the dominant force corrupting and enslaving the Old World. Player gets to choose among four gods. Khorne, the god of battle, Slaanesh, the god of sin, Nurgle, the god of disease or Tzeentch, the god of magic. Each god has different powers, special abilities, and a distinct army of loyal followers resulting in a unique strategic play. To win the game, you need to know and play to your god’s strength. Else, you get to fall together with the Old World. At heart, Chaos in the Old World is an area control game with some epic battles mixed in. Every turn you get to control your demons to corrupt the regions, dominate its inhabitants, and crush armies of other gods. The gameplay is reasonably straightforward and takes around 15 minutes to learn. Each turn starts by drawing a Chaos card affecting the state of the Old World. The effects are typically temporary and only last throughout the current round. Once the Chaos cards are resolved, the Summoning phase follows. During this phase, the gods get to spend their power points. You can choose to summon armies of demons for the upcoming battle or cast some deadly spells. With a few enticing options to choose from, spending points wisely create exciting dilemmas each turn. Next, it is time to crush some rival armies that share the same region. Battles are optional and can be quite risky for most gods except probably Khorne. Cards can be played during battles to provide a significant battle advantage or constraint your opponents’ actions against you. Lastly, it is time to mark the gods’ presence by spreading corruption in occupying religions. Cultists are essential at corrupting lands but are worthless in combat. Since each god has a distinct way of spreading corruption, cultist strategic placement is key. Given that most games are won through land corruption, protecting cultists is paramount. To add to the huge variability the game already offers with each god having a unique style of play, there are also four different ways to win the game. You can either level up your god until he reaches its peak, ruin 5 regions, deplete chaos cards deck or be the first to score 50 victory points. Carefully thought out and balanced asymmetry coupled with an incredibly well-executed theme makes Chaos in the Old World a brilliant fantasy game. The board looks tight and feels busy as there is a lot going on. It makes you constantly check other players to see what are they up to and how are they tracking on their way to one of the four win conditions. With so much happening on the board, you would think that the game should be a lot more complicated and take hours to play, but the game is surprisingly simple and can be enjoyed in well under two hours. Learning the basic game mechanics should take you 15 minutes and then you are off to experience a great fantasy game that deserves a place in any board gamer’s collection. Chaos in the Old World is an incredible fantasy war game that has all the right ingredients for a quick, simple, yet fun and tense experience. The game offers a unique asymmetrical play for each of the gods and four winning conditions. It brings plenty of fantasy world variety to enjoy in a busy thematic setting. If you ever wanted to be an evil god casting spells, crushing opponent’s armies and corrupting land to bring chaos to the Old World – this is one of the best fantasy board games on the market. 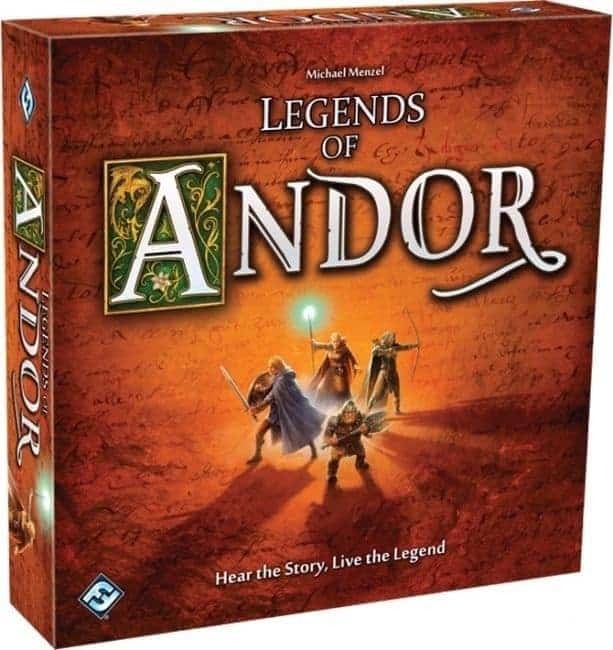 Legends of Andor is an adventure game where players take on roles of heroes protect the realm of Andor. Each player gets to choose either a warrior, wizard, archer or a dwarf. After forming a team, they work together to counter the invading horde of evil creatures and monsters. The large double-sided map, player boards, and cards are dripping with theme and beautiful artwork. They deliver the first punch of a fantasy board game experience without us even playing the game yet. The game comes with six scenarios or what the game calls ‘legends’. Five of which are stitched together to form the game’s narrative. The last one, however, is blank for you to craft your own story! Legends of Andor is unlike anything we have played before, and it is hard to explain why without giving some spoilers away. It starts with a four-page rulebook (yes, only four pages!). The rules tell just enough to be able to set up and start the game. Then, the storyline takes over, and you learn the rest of the game as you play along. Rounds in the game are represented by days. At the beginning of each day, players get to take actions measured in hours (i.e., action points). Once the player is out of hours, the day ends. Alternatively, you can push your character to do up to three more hours a day. Depending on the circumstances, it may be a viable option, but it is important not to overuse it. Pushing your characters makes them tired and loses willpower which is essential when fighting monsters. Each time the day ends or the monster dies, the narrator pawn advances on the narrative track. Advancements reveal new legend cards that tell the essential part of the scenario puzzle and add twists to the storyline. This system makes the gameplay intriguing and fun. On the other hand, playing the same scenario for the second time is a lot less rewarding. Although there is a healthy portion of battles to be had in the game, the combat mechanism is straightforward. Dice and different modifiers are used to determine the overall strength value and resolve battles. The opponent who ends up having a higher strength value wins the battle. It is that simple. The key, however, is picking the right battles to fight. Killing too many monsters advances the narrative quicker leaving you less time to complete the objectives. On the other side, not killing enough could see them overrun the castle and end the game. Player interaction and cooperation is what drives Legends of Andor. As a team, you get to decide which quests to do, who does it and jointly balance the time track. The latter poses the biggest challenge of the game. You want to ensure you can complete the objective in time but not let the monsters overrun you. The game is also extremely family-friendly as it is cooperative, fun, engaging and easy to play. If you are looking for one of the best fantasy board games for a great family evening, Legends of Andor is worth checking out. Legends of Andor is a true fantasy story-telling experience that feels more like reading a book than playing a classic adventure board game. It comes with a beautiful fantasy setting that features the ‘learn as you go’ mechanism. Adventures are glorious, thematic and simply epic. Unlike anything, we’ve tried before that plays under two hours. Each legend is an intriguing fantasy story with multiples twists, and the last legend – you get to craft it yourself! What is a campaign mode? Campaign mode board games have grown in popularity over the last couple of years. In fact, so much that the #1 board game in the world according to BGG features campaigns. Understanding campaigns, however, is pretty simple. They represent a bunch of scenarios or quests stitched together that share the same thematic and storytelling experience. In addition, campaigns have historically been heavily attributed to role-play gaming. What is an Ameritrash board game? Ameritrash is one of the two main directions of board games (the second one being Euro). Ameritrash board games are typically loaded with miniatures, large boards, lavish artwork, plenty of cards and ample dice rolling. It is safe to assume that most of the fantasy board games out there are Ameritrash. Some, however, have Euro-style mechanics mixed in. What is an asymmetrical board game? Most board games feature the same rules, capabilities, actions and winning conditions for all players. In Asymmetric board games, however, it is the exact opposite. On the contrary, each player gets to represent a character with unique gaming style, actions, special abilities and win conditions. The trick of the asymmetrical approach is to keep the balance right to give each player equal chances of winning. Difference between fantasy and adventure games? A fantasy board game does not need to be adventurous, yet adventure board games are often fantasy themed. Typically, adventure board games have players venture on quests, conquer new lands, fight evil monsters together. There are also board games when one player takes the role of an overlord and others are heroes. What is Board Game Replay Value? It means how the board gaming experience holds up when playing the game or scenario multiple times. Board games with low replay value tend to wow players on their first attempt. The subsequent games, however, do not feel as spectacular as the first ones. Conversely, board games with high replay value keep players engaged and interested from one game to another. There needs to be a MineCraft board game ♟! And where is Warhammer Quest: The Adventure Card Game? I would have definitely added Kemet – love it! Is Gloomhaven that good? Really? 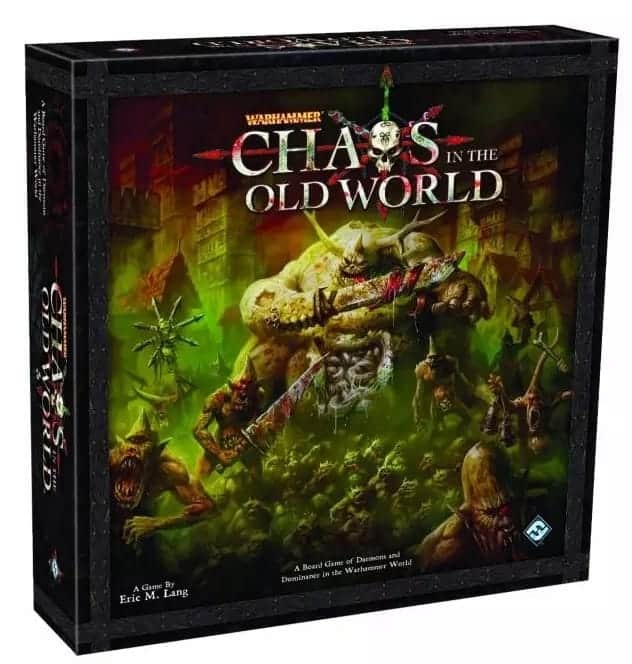 Chaos in the Old World is pretty old for a review in 2019, no?